Instead of forcing your readers to try and find the link to your contact details, then load a new page, before sending you a message, this plugin makes it as easy for them to get in touch by removing all the superfluous steps that traditionally make up the process. 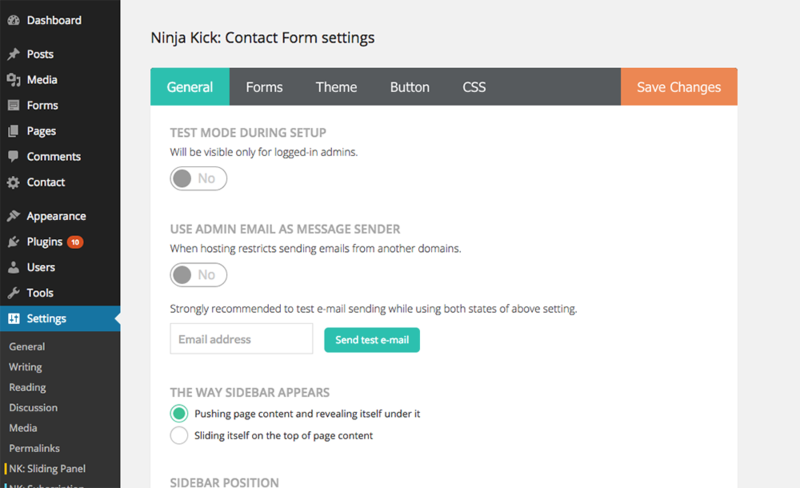 Ninja Kick: WordPress Contact Form Plugin comes with 3 terrific themes, social bar, Mailchimp integration and extensive customization on design. This lightweight plugin uses modern CSS3 transitions, has layout responsive to screen size changes, works well on mobile devices and reacts on swipe gestures. 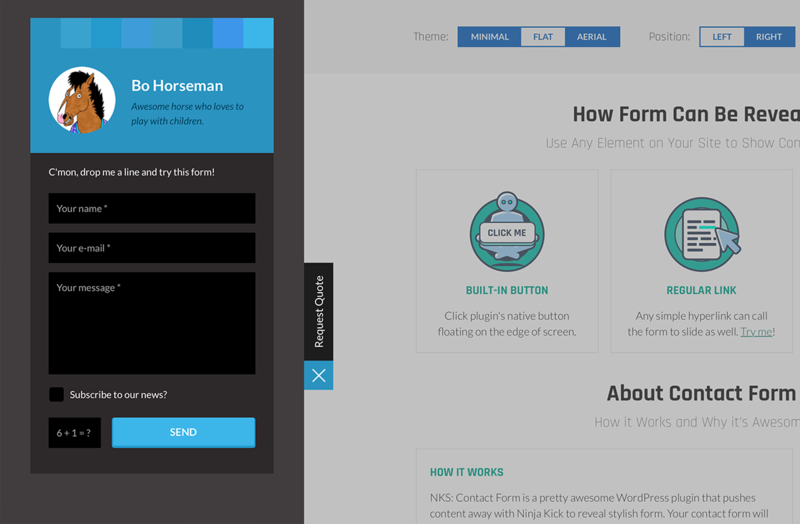 Form submits via AJAX so doesn’t reload your page. 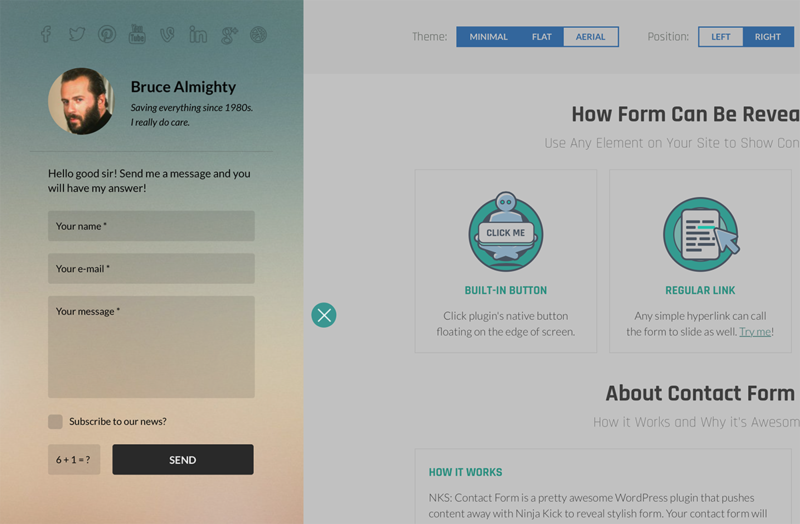 Give a try how it works and looks on WordPress Contact Form Plugin Live Demo Page! If you’re looking for more universal WordPress solution for sliding panel with same off-canvas effect take a look at another plugin from series ? 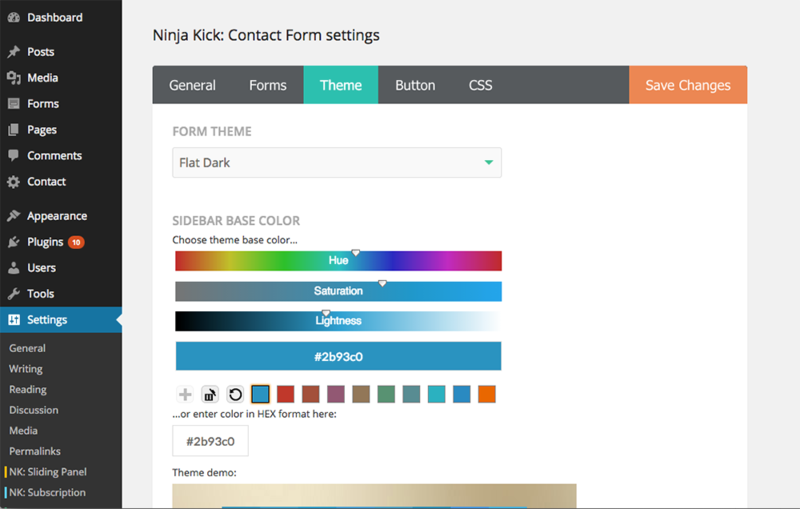 Ninja Kick: Sliding Panel for WordPress. You can insert any custom content. Message logging to .txt file. 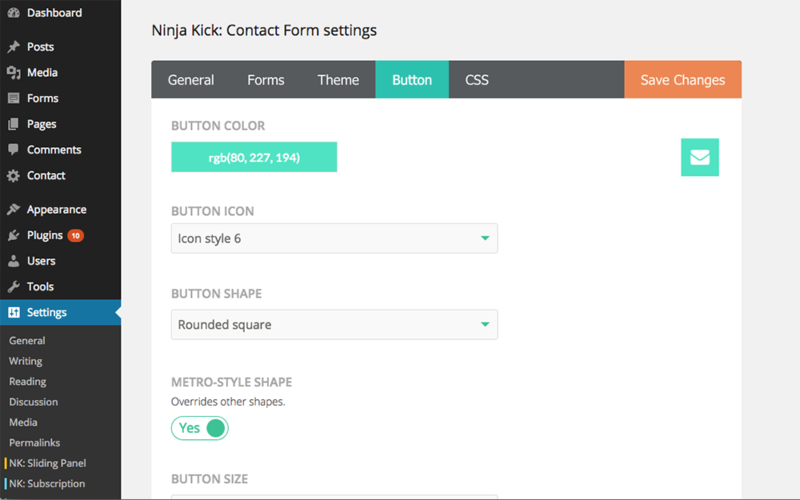 Stylings for Contact Form 7 shortcodes. Also will work with not very complex Gravity Forms shortcodes. 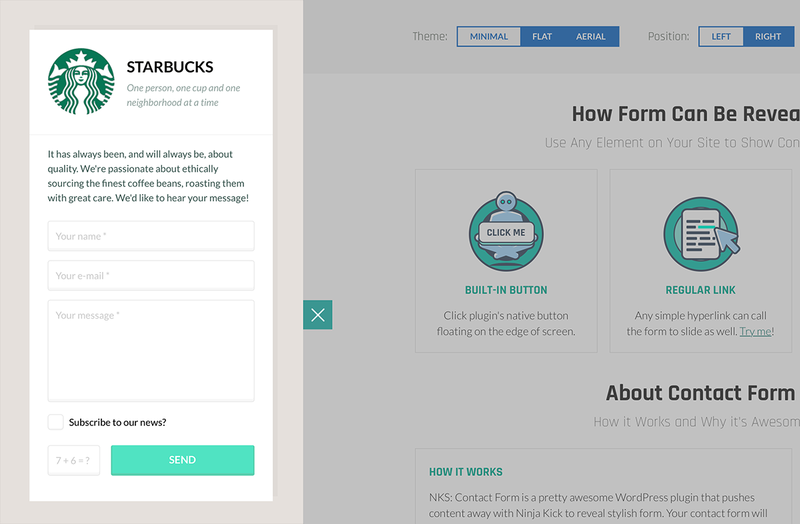 It should work with other form shortcodes. Guide: How to add checkboxes, dropdowns etc. Option to hide built-in floating button. 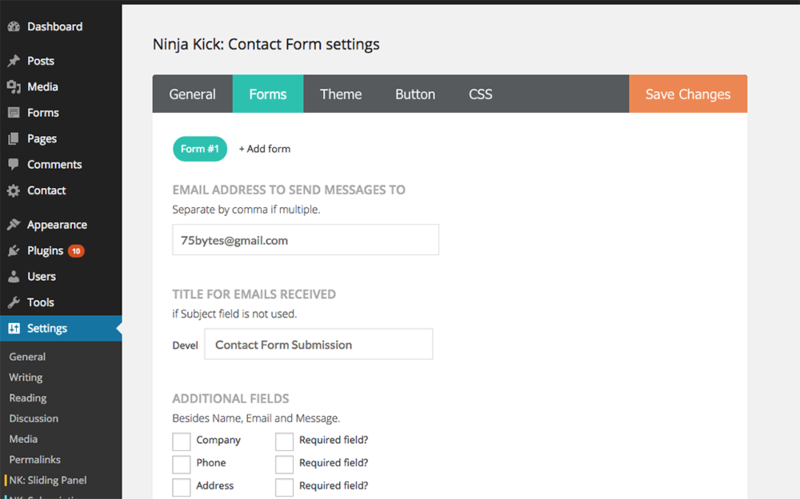 You can trigger contact form opening from any element on your page like menu button, any link or image). Refer to this guide. User-friendly Settings page. Check out screenshots. Use built-in background library or upload and use your own image. WPML support using this module String Translation. Localization for languages: English, German, French, Italian, Spanish, Russian, Turkish, Polish, Finnish. If you have improvements please PM to me your translations. Chrome browser has some glitches rendering fixed background (background-attachment:fixed rule) after CSS transformations applied to parent elements (which can be happening when plugin pushes content). Background becomes static and flickers. This cannot be fixed until Chrome devs fix this for their browser. Plugin applies workaround for this case when body element has fixed background. For rest elements it applies background attachment ‘static’ in Chrome. You can use slide out animation instead of pushing content if you want your background to be fixed. Also you can request test for your theme via PM. Only jQuery 1.7+ is required on site. All plugins are compatible and develop synchronously. You may expect new features available for all of them. Purchasing on CodeCanyon guarantees lifetime free updates.